There’s one exception to that rule and that’s an app that provides sound files from all makes and most models. I LOVE this app! Though I wish it had the sound files from the Samsung Galaxy Nexus. Maybe they’ll add those later; crossing fingers. Select your brand, and you’ll see all the available models in the app. Like the iPhone? 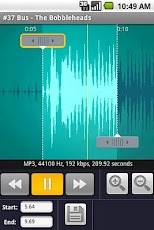 You’ll find sound files from the iPhone4, 5 and 5S. Got a Samsung, check out nearly every Galaxy device and their sounds. When you find one you like, you can download it for free and create it as a ringtone, alarm or notification sound. The app will copy the file to the appropriate location on your phone so you can choose it in whatever app you want to use that sound file in. There are two products that are recommended for creating your own ringtones. This one and one that runs on your pc. I tried the PC version program. I hated it! And who wants to transfer files back and forth between your PC and phone. How about simply use your smart phone to convert a downloaded piece of music to the notification, ringtone or alarm you want. RingDroid does exactly that and it’s much easier to use. After using RingDroid for a week, let me say I LOVE IT! I hooked my phone to my laptop and transferred some mp3 files I wanted to use for ringtones and notifications. But they aren’t showing up as compatible for the Nexus. 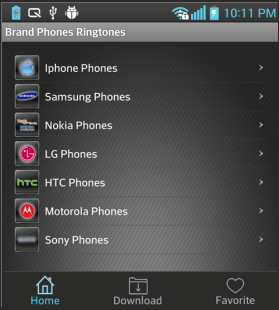 Start up Ringdroid and open the MP3, save it with a new name as a ringtone OR a Notification and tada you have your favorite song on your new phone! (Thanks to the Folks on Galaxy Nexus for this tidbit! ).